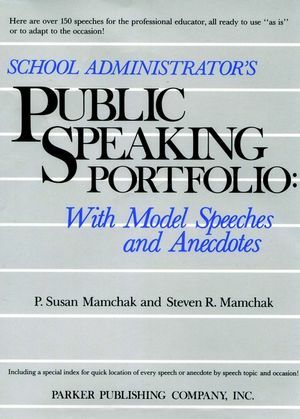 This book contains 158 speeches for the professional educator on virtually every subject related to education, all ready to use "as is" or adapt to the occasion. P. Susan Mamchak has held a variety of positions in education, from classroom teacher to school disciplinarian. Steven R. Mamchak is a veteran of 35 years in the public schools and the recipient of a Governor's Award for Excellence in Education. How Administrators May Effectively Use This Book. Part I: Effective Model Speeches For All Occasions. Section 1. A Collection of Icebreakers for the School Administrator. Section 2. An Administrator's Guide to Introductions, Transitions, and Benedictions. Section 3. A Complete Collection of Opening and Closing Speeches. Section 4. Administrator's Speeches for Laymen. Section 5. Administrator's Speeches for Educators. Section 6. A Variety of Speeches that Inspire. Section 7. Dynamic Speeches for Retirements and Testimonials. Section 8. Dignified and Meaningful Eulogies and Testimonials. Section 9. Speeches for Special Event. Section 10. Lively holiday speeches for use throughout the school year. Part II: An Administrator's Blueprint for Preparing and Delivering a Speech. Section 11. A Step-By-Step Guide for Preparing and Delivering a Speech. Section 12. An administrator's Survival Guide for Avoiding the Pitfalls of Public Speaking. The School Administrator's Locatomatic Index of Speech Topics and Occasions.